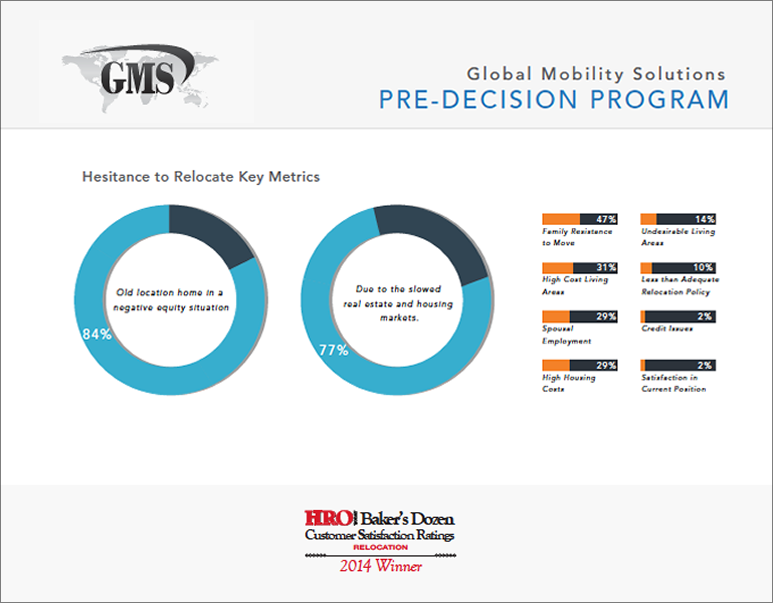 Global Mobility Solutions is the original pioneer of the benefits of pre-decision services. Our clients know that partnering with us at the start of the relocation process helps identify the markers of a successful relocation and greatly enhances transferee productivity. Our wide range of services help clients identify those employees who are the best fit for the assignment. Relocation technologies and systems let clients manage employee relocation programs with ease. Among the many services GMS offers, candidate assessments have become critical for clients to be able to assess expectations, skills, qualities, financial, and family issues that can impact the success of a relocation. Clients should examine candidate circumstances to identify prospects likely to succeed. For the candidate, pre-decision services that provide them with valuable information they can use to make their determination include helpful information about cost of living, housing markets, school reports, and moving costs. Candidates indicate that community searches and tours are very helpful to them in understanding the new location and helping them to select areas that are best suited to their needs. Our relocation experts have created systems and processes designed to help clients manage their Global and North America relocation programs quickly and efficiently. We provide high-touch customer service, policy expertise, benchmarking, and flexible reporting options. Clients achieve the most success with a customized, right-fit program for relocation that is specifically designed to meet their unique requirements. Employees and their families expect a broad range of services to help them during their relocation process. Our pre-decision services help clients and employees throughout the relocation process, and help ensure successful relocations. The benefits of pre-decision services to clients and candidates serve to ensure successful relocations. The corporate relocation experts at Global Mobility Solutions (GMS) have the knowledge and expertise to help your company assess candidates for assignments and provide your employees the best relocation experience. Contact our team of experts to discuss how we can implement pre-decision services in your company’s relocation process, or call us directly at 800.617.1904 or 480.922.0700 today. What are the Benefits of Outsourcing Relocation Programs?